As we age, our dental health care becomes even more important. With an estimated 75% of adults ages 60 and older only having a portion of their original teeth, oral and overall oral health is are gaining attention. Issues such as gum disease, diabetes, and heart disease can contribute to poor oral health and tooth loss. 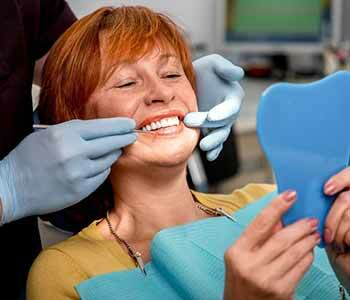 Once teeth have been lost, dentures are an option for replacement. Located in Gambrills, MD, Dr. Bingham-Lester offers full, partial, and immediate dentures for patients who have lost teeth. The type of dentures used depends on each patient’s needs, health history, and budget. Following conservative dentistry practices, we prefer to maintain the natural teeth for as long as possible. Your teeth stimulate bone structure keeping your oral cavity healthy. Transitional dentures may be recommended to retain the natural teeth with the option of adding to the denture as needed. Regardless which dentures you may have, it is important to take care of your dental device to prevent problems. Properly fitting dentures help avoid issues. Assuming your dentures fit properly, it is important for everyone to follow good oral hygiene habits to keep the mouth clean and healthy. Having a healthy mouth and gums helps to prevent dental issues from arising. Do not sleep with your dentures in unless your dentist instructs you to do so. Handle your dentures carefully as they are delicate. Clean and massage your gums, tongue, and roof of your mouth daily.